Generally, when you see a recipe on this blog, something came from a plant on deck. Full disclosure: not this time. We consider ourselves devoted omnivores, but there are a few vegetables that we both ban. Beets, for example, and winter squash. Lately, though, our horizons have been expanding and several previous disliked (by one of us) vegetables have entered into regular rotation. Until last night, broccoli belonged in that banned category. Some of us have long-loved the cancer-fighting little green trees, others, not so much. As in, it’s never been prepared in the kitchen below the deck. And then it appeared in our Greensgrow CSA share. Woo hoo! We simply had to do something with it. And it was liked by all. If you’re looking for the original recipe, seriously, got to Smitten Kitchen. If you’re looking for a recipe that made use of what happened to be in our kitchen (cherries from Traverse City, MI and spring onions from Philadelphia, PA), this was pretty freaking amazing. 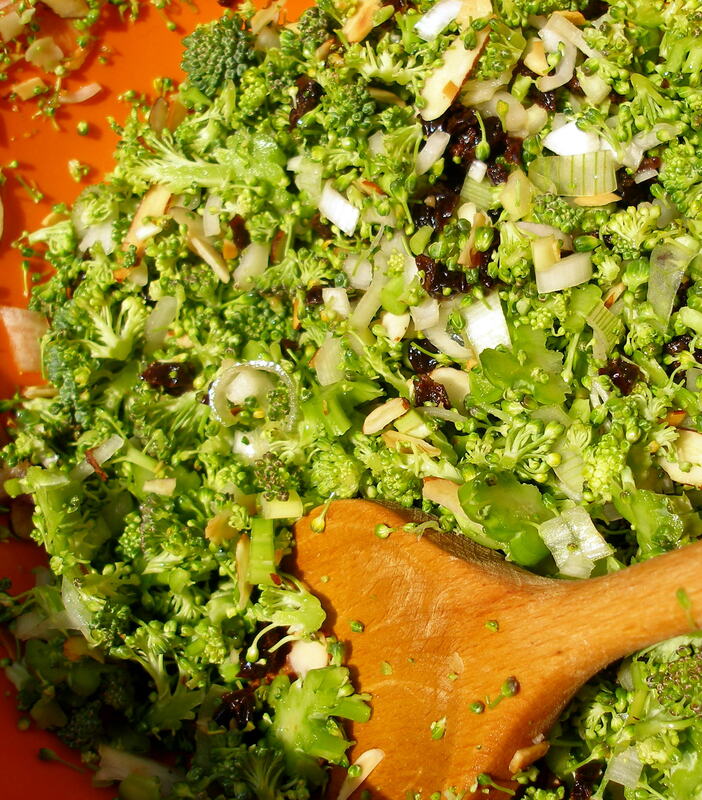 Trim the broccoli into large chunks. Very thinly slice (as thin as you possibly can) the little heads, use as much of the stalk as you’re comfortable with. Mix in the sliced almonds, cherries, and onions. In another bowl, mix the dressing together. Pour the dressing over the broccoli mixture. Taste for salt and pepper. Enjoy.